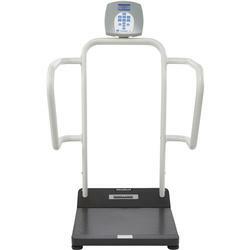 The scale is set up to use motion-sensing weighing technology, to determine the actual weight of a moving patient. 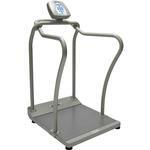 The scale may be changed to measure live weight; see page 12 for instructions on changing the scale setting. The weight can be display in pounds (decimals, fractions of a lb or lb/oz) or in kilograms. The 1100KL features a wrap-around handrail for patient comfort and safety and a 180 degree swivel/pivot head for reading from either side of the scale. Also included on the platform scales are two wheels for easy mobility. The unit can be operated using its AC adapter or by 6-D cell batteries (not included).